Haven’t decided on a hotel yet? You can look at other available hotels in the Poitou-Charentes region with Booking.com. 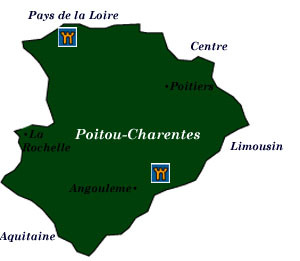 Occupying part of France’s long Atlantic coastline, Poitou’s gently rolling and unspoiled countryside is named after the ancient town of Poitiers, while Charentes comes from the two départements within the region linked by the Charente River. Poitou-Charentes, part of the dowry of Eleanor of Aquitaine in the 12th century upon her marriage to Henry II, was ruled by the English, much to the dismay of the French. The turbulence of the Hundred Years War left a number of mighty fortresses dotting the countryside, with many destroyed during the subsequent Wars of Religion. Life in this region remains refreshingly tranquil. You’ll find crowds during the holidays, but nothing like the Loire Valley or the south of France. La Rochelle Historic port and former Huguenot stronghold, La Rochelle is a vibrant and unpretentious town. Worth a visit is the Vieux Port, a delightful place in which to stroll along arcaded streets, café sit, and absorb history (La Rochelle was once one of France’s most important ports. From here trade links were established with North America). On either side of the harbor are two fortified, 14th-century towers, the Tour St-Nicolas and the Tour de la Chaîne. A third tower, the 15th-century Tour de la Lanterne is just a little farther on. All three towers are climbable, with great views from the top. Poitiers Great battles that determined the course of French history took place in the area of Poitiers. In 732, at the Battle of Tours, Charles Martel stopped the Arab invasion, and in 1356, the Battle of Poitiers, fought between the armies of Edward the Black Prince and King John II of France, led to a major English victory. Home to a number of remarkable Romanesque churches, of which Église Notre Dame la Grande is the most notable. Just north of the city is Futuroscope, a hugely popular French theme park that presents state-of-the-art visual technology in futuristic architectural surroundings. Cognac Spot the telltale stains of black fungus from alcohol evaporation on the sides of buildings, odds are you’re looking at a cognac warehouse. In the town of Cognac, you’ll find the great houses that distill the precious spirit. Interesting tours can be taken at the 13th- and 16th-century Château de Cognac, birthplace of King François I in 1494 and home of Otard cognac. Other houses are Hennessy, Martell, and Rémy-Martin.